We are just about conclude a record year for theatrical animation in the Wide Wide World of Toons. There were 21 animated feature films making their debut in the United States this year. This is up nearly 100% from last year when only 11 films made their debut, and back to 2002/2003 levels when the average was of 19 films per year. Of these 21 films, it is important to highlight the presence of 6 non-American films that made their North American debut this year. These six films represent the growing presence of foreign films in the American market, as well as the rising number of foreign studios investing in animation. Many of the major animation studios from around the world were represented this year with films coming from Japan (Paprika), France (Renaissance and Arthur And The Invisibles), The United Kingdom (Doogal and Flushed Away), and even Norway (Captain Sabertooth). Some of these films were successful, while others failed to capture any attention. However, looking at these films, it is interesting to see that many of the current trends in Hollywood have gone global. Foreign studios are facing some of the same challenges American studios have been facing regarding the use of new technologies and the continued debate between computer-generated vs. traditionally animated features. And while only a handful of foreign films are released in the United States each year, there have been an increasing number of foreign directors working directly for American studios. The success of foreign animation has come a long way since The Magic Horse became the first non-American animated feature to debut in American theatres in 1949. With the United States being one of the largest film markets in the world, it is only natural that it attracts animated films from all corners of the Globe. Perhaps the most significant contributor to foreign animation in the United States has been Japan, with an animated film industry that has some of the world’s finest artists. Along with Japan, Europe continues to be the source of excellent work by both French and British animation studios, many of which have collaborated with each other and with other countries to produce some of the best films in their years. 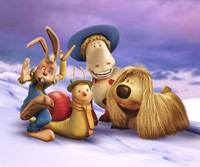 British studios such as Aardman, which introduced the world to characters like Wallace and Gromit, have left their mark on animation with their unique stop-motion animation style. While probably most notable for their Asterix and Tintin animated adventures, French animation has been present in the last decade with films such as Kirikou and the Sorceress (2000) and Kaena: The Prophecy (2004). Of course, the most recent crown achievement in French animation was Sylvain Chomet’s The Triplets Of Belleville (AKA Belleville Rendez-vous), which was actually a collaboration between French, Belgian, and Canadian studios and went one to earn two Academy Award nominations. In fact, since the creation of the category of Best Animated Feature at the Academy Awards in 2002, all three of these countries have had their films nominated for the award, and two films (Wallace & Gromit in The Curse of the Were-Rabbit from Great Britain and Spirited Away from Japan) have actually won the award. Japanese director Hayao Miyazaki became the first foreigner, and only the second person ever, to win the Academy Award for Best Animated Feature Film for his amazing work on Spirited Away in 2003, and was nominated a second time earlier this year for Howl’s Moving Castle. All of this has become a testament to the quality of the animation that has been coming from around the world. It will be another two years before American screens are graced with another Miyazaki film, but that doesn’t mean that quality in the Japanese animation industry is limited to one person. Paprika, the year’s sole anime release, is director Satoshi Kon’s follow-up to his critically acclaimed films Millennium Actress (nominated for 4 Annies in 2004) and Tokyo Godfathers, both of which were released in 2003. The film is about a doctor, and her alter ego Paprika, who is investigating the loss of a device that allows them to analyze a patient by entering into their subconscious mind. The film, which is being released by Sony Pictures Classics, made its debut last September at the Venice Film Festival and received a limited release for Academy Award consideration a couple of weeks ago before reportedly going wider in March 2007. With five spots in this year’s Oscar race for Best Animated Feature, maybe the Academy will save one for this talented and visually innovative filmmaker. Anther visually innovative film to come out this year was France’s Renaissance, which is being released by Miramax in the United States. The plot of the film revolves around a detective named Karas who is investigating the disappearance of a researcher. The noirish film is set in the futuristic Paris of 2025 when the lives of private citizens are being monitored daily and corporations rule the world. Director Christian Volckman used innovative motion capture techniques that allowed animators to capture clothing as well as the actor’s eye movements, adding to the graphic quality featured in the film. Its black and white color palette only enhances the noir-like feel of the movie. The movie won the coveted Feature Film Award at this year’s Annecy International Animated Film Festival back in June and made its American debut in September. While both of these films only saw limited releases, British imports continue to be getting the most amount of attention in Hollywood. Both Doogal (The Magic Roundabout in the UK) and Flushed Away got wide releases and media attention when they were released. However, both had very different receptions. The Weinstein Company basically dumped Doogal, a film about four friends on a quest for some mystical diamonds, in the market back in February, and the critics destroyed the film warning viewers to stay away. It worked, but the film still went on to gross over $7 million, which sadly is far more than most foreign animated films ever make in the full theatrical run. Flushed Away, on the other hand, is faring much better, having so far grossed over $50 million in the USA alone – already more than Aardman grossed with Wallace & Gromit last year. However, the film was rumored to be the reason behind DreamWorks’ decision not to renew their distribution deal with Aardman due to the high costs (rumored to be nearly $140 million) involved in the making of the movie. The film is about a high society mouse named Roddy that gets flushed down to the sewer world of Ratropolist and uncovers an evil plot by a villainous toad to destroy all rodents. The film, which is being distributed by Paramount, is still in the American Top 10, and has a good financial outlook as the holiday season continues. Flushed Away features two major trends that have been prevalent in Hollywood this year, and it is the example of how these trends have become prevalent around the world. The running theme of the year in animation was animals on an adventure. In this year of grumpy mammoths, cuddly forest creatures, dancing penguins and stranded bears all running for their lives, Flushed Away fits in nicely with the same theme. In another trend, Aardman, a studio that has always prided itself with its innovative and unique stop-motion animation style, used CGI for the first time. In fact, of the six foreign animated films this year, only two (Paprika and Norway’s Captain Sabertooth) are traditionally animated while the rest are computer generated. This is also reflected in the American films that came out this year with Curious George being the only major Hollywood release to feature traditional animation. This trend is particularly troubling for Japanese animation, which relies heavily on traditional animation techniques, leading to a steady decline in the amount of anime released in the past few years. Sure, many of these films have a long life on television and on DVD, but Paprika was only Japanese anime film released in theatres this year, and that was only a limited run! This number is already down from the 3 released last year, 2 in 2004, 8 (!) in 2003, 4 in 2002, and 6 in 2001. While the future remains uncertain for the Japanese releases, it also remains to be seen if the heavy investment in CG animation in other countries will pay off for those studios. While British films seem to following the CG animation trend, France seems to be making good use of new motion capture techniques. As already mentioned, Renaissance relies heavily on motion capture technology similar to the ones used this year for Monster House. In an interesting coincidence, the year’s other French release, Arthur And The Invisibles (Arthur Et Les Minimoys), a live-action/animation combo, also relies heavily on motion-capture technology for its animated sequences. The film, directed by French director Luc Besson, most famous for The Fifth Element and Leon, is about a young boy (played by Freddie Highmore) who goes looking for a secret treasure in the land of the Minimoys to save his grandfather’s house from destruction. The all-English speaking cast is also part of a new trend in European animation that is directly targeting American audiences. A similar trend is happening in Spain where Filmax Animation is animating their upcoming Donkey Xote in English sync to give it a better chance with American distributors (after all, the title’s pun only works in English). Even the recent French/Danish production of Asterix and the Vikings was animated in English sync by the former staff of Disney’s Paris animation studio. Finding American distribution seems to be the main challenge facing foreign animated features. Even major studios like as Aardman and Vanguard Animation (the British subsidiary of Vanguard Films) are having trouble this year. It should’ve been a great year for Aardman with a new film in theatres and an Academy Award for Wallace and Gromit in the Curse of the Were-Rabbit, but DreamWorks Animation recently announced it was no longer going to finance and distribute Aardman films in the US. Vanguard, on the other hand, must overcome the bad press that surrounded Valiant’s American release last year when it performed poorly at the American box office. Only recently did it enter into an agreement with Lionsgate to distribute its upcoming Happily N’Ever After. The truth is that most foreign animated films never even make it to the United States and few find distribution outside of their home countries. Take Denmark’s Hjælp, Jeg Er En Fisk (Help! I’m a Fish) as an example. While it made its premiere around the world and did decent business in Europe, the film was only recently released in the US this year (6 years after its debut in Denmark) as a straight-to-video release. And while on the topic of Scandinavia, the year’s stand-alone foreign film release not from a major country was Norway’s Captain Sabertooth (Kaptein Sabeltann), which also struggled to find distribution in the US. The film, directed by Stig Bergqvist who charmed audiences in America with his work on Rugrats in Paris: The Movie, came out in limited release last October after a distribution deal with Indican Pictures. The story is about a young kid named Tiny who wants to impress Captain Sabertooth with his bravery by finding a long lost treasure. While the future continues to look bleak for small or traditionally animated films such as this one, a big studio like Aardman should have no trouble finding distribution given its recent successes. Although there were only a handful of foreign films released in the US this year, there were several foreign directors working on prominent American films. Four of the year’s biggest animated releases – Ice Age 2: The Meltdown, Monster House, Happy Feet, and The Wild – have foreign directors at their helm. Some are new, just now making their mark in the medium, while others have already proven themselves in the industry. Monster House’s Gil Keenan (from the UK) and The Wild’s Steve “Spaz” Williams (Canada) both did fine jobs directing their debut films. Brazilian director Carlos Saldanha, who co-directed both Ice Age and Robots at Blue Sky with Chris Wedge, finally got full screen credit for Ice Age 2, and is probably looking at his second Academy Award Nomination next year. After producing the excellent partially animated film Babe and directing its sequel, Australian writer/director/producer George Miller returned to animation this year with his successful work in Happy Feet, a movie that, while American-financed, was actually animated in Australia. So at the end of 2006, what can we conclude from this year in the Wide Wide World of Toons? Well, for one thing, it seems clear that the same trends that we have found in Hollywood in the past few years have become prevalent worldwide. There have been good films and some bad films, and the best films this year (both foreign and domestic) have been those with a clear artistic vision and good, old-fashioned character development. The future is both promising and challenging for foreign animation in the American market. While distributors have been demanding more and more animated features, domestic film production is also rising which may lead to an oversaturation in the near future, particularly for computer animated films. And while on the topic of computer vs. traditional animation, the debate continues, and now on a much more global scale. Traditional animation continues to be in decline, and it remains to be seen just how much Japanese animation will continue to be affected by this. Financially, it also remains to be seen if Aardman’s investment in computer animation will pay off or will lead the studio to its ruin. And while the world eagerly awaits a new film by Sylvain Chomet, French animation is banking on a successful return on the $80 million invested in Arthur And The Invisibles. At the moment, foreign films continue to find distribution – just – but perhaps the flurry of excitement we witnessed in the last couple of years has died down, along with the declining grosses in general for most major animated features, despite a record year. As the world moves towards a global marketplace for both artist and their films, we can only hope that moviegoers and distributors will be able to see that there’s a wealth of talent already out there in the Wide Wide World of Toons ready to show them a unique and exciting voice through animation.